The Financial Times pulled off quite a feat in their April 14th editorial on the persecution of Christians in the Middle East: they somehow managed to avoid so much as mentioning the Israeli exception to this disturbing phenomenon. Their omission of Israel’s unique progressive advantage in this regard was even more glaring in light of the editorial’s opening sentence. On Palm Sunday, as Christians gathered to commemorate Christ’s entry into Jerusalem, jihadi suicide bombers blew themselves up outside a Coptic cathedral in Alexandria, and at the altar of a church in Tanta, in the Nile Delta, killing 47 people. FT editors failed to contextualise this remarkable contrast – between the sight of thousands of Christians freely gathering in the capital of the Jewish state and Christians again being butchered by jihadists in an Arab capital – by noting that the rights enjoyed by Christians in Israel simply do not exist in the Muslim Middle East. 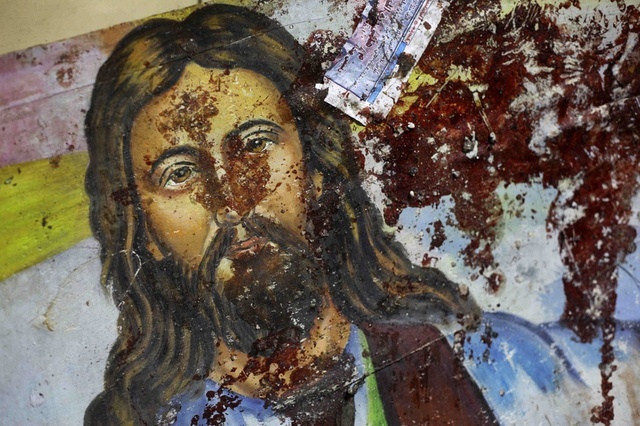 A blood-spattered poster of Christ inside a Coptic Christian in Alexandria, shortly after a 2011 attack. Israel is in fact one of the few places in the Mid-East where the indigenous population of Christians is growing. Though the editorial is also notable in all but ignoring the role of radical Islam in the flight of Mid-East Christians, whilst absurdly blaming the West and Christians themselves, its obfuscation of Israel’s achievement in creating a ‘safe space‘ for religious minorities represents another example of the media’s inability to re-evaluate their own narrative framing the state entirely through the prism of the Palestinian conflict. FT joined the Israel (hmm …)-hating bandwagon some time ago. What the Financial Times really means is that the Middle East does not include Israel. In most of the commentary on the Middle East emanating from the West, even those on the Left consider Israel to be a Western style democratic country and therefore more like “us” Westerners than those “others” namely the Arabs. It’s a subconscious form of paternalism which, without noticing the irony of their own position, the Left would otherwise denounce as “Orientalism”. So, eventhough about half of the Jews of Israel can trace their ancestry to Arab countries from which their parents or great-grandparents were expelled after 1948, Israel is viewed as the regional outlier and so just doesn’t come up in discussions of intra-Arab problems. Still, it would help the general public place Israel in a more accurate light if the media compared it to its neighbors instead of against some one-off standard of perfection. Interestingly the joke we have come to love, the newly adopted ” definition”, deliberately refused to include that it was ok to hold Israel to the standard of liberal democracies as recommended by the All Party Committee. This was under pressure from CST.. The reason of course is that this is the last thing Israel and you guys and gals would want. “Liberal democracies” are hardly standards of perfection. Stephen in your first sentence you mention “..the standard of liberal democracies..” you then go on to write ‘ “Liberal democracies” are hardly standards of perfection.’. Name one or more countries that you regard as ‘liberal democracies’ and explain how they have, or why they have not, achieved standards of perfection. Gerald the point is that far from demanding that Israel be held to some standard of perfection it was merely felt that it should be held to the standards of liberal democracies. It rejects that which is hardly surprising. No Stephen the point is that , once again, when asked to clarify the view expressed in your post you are unable to. Let me know when you are able to express a point of view that is clear, logical, rational and based on fact. Although based on your past performance here and on other websites I will not hold my breath waiting. What does that have to do with the fact that Christians are thriving in Israel and that the British press will be damned before ever reporting it? The fact is that Israel is held to a far stricter standard that other liberal democracies. And we know why that is. There is no point in you trying to hide it, as if you, of all people, could. “Liberal democracies” are hardly standards of perfection. Interesting. Years of reading The Guardian, and to a certain extent, the BBC, I have ‘learned’ that democracy is only ‘good’ if an election returns a radical extreme pseudo left wing government.